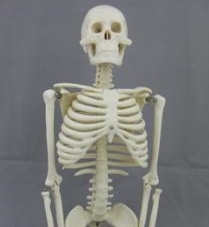 Medical style skeleton made of solid pvc and fully articulated wired parts. Stand 5′ 6″ tall. shipped mostly assembled. Just attach arms legs and skull via pins provided. Great reference or frame work for a custom prop. weighs approximately 15 lbs. 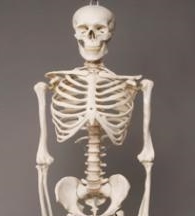 Tough durable skeleton. Used by doctors, chiropractors, therapists. Not the typical Halloween Skeletal models.